Fountain Farm, Church St, was sold to Jacob Wisbey (1777-1850). Jacob’s occupation is recorded in 1814-1822 as a higler (a person who carries from door to door, and sells by retail, small articles of provisions, etc) but by 1838 he is recorded as a farmer, as he was until 1850 – the last available record before his death. It is recorded that in 1830 at auction he sold arable land at Park Field, Harston (of 2 acres, 2 rods and 5 perch) for £7. He was a member of the Stewards of a Friendly Society, Harston (also called Amicable and Brotherly Society of Tradesmen, which provided relief for any of its members afflicted with illness, (see Morning Post, 16 Jun 1849, p7, col 1) for 33 years. He claimed £9 12s when a horse fell on him in Nov 1846 and was incapable of work as the right side of his body was paralysed. The Friendly Society offered 12s per week until 6 Sep but the Stewards of the Friendly Society subsequently appeared in the Court of Chancery for non-payment (Cambridge Independent Press, 11 Nov 1848, p3, col 5). When Jacob died in 1850, the property was left to his second son William (B:1809) who died 1872, after which William’s son David (B:1850) moved there with his wife and two daughters. In 1881 David’s mother is recorded living with him and his wife had died. 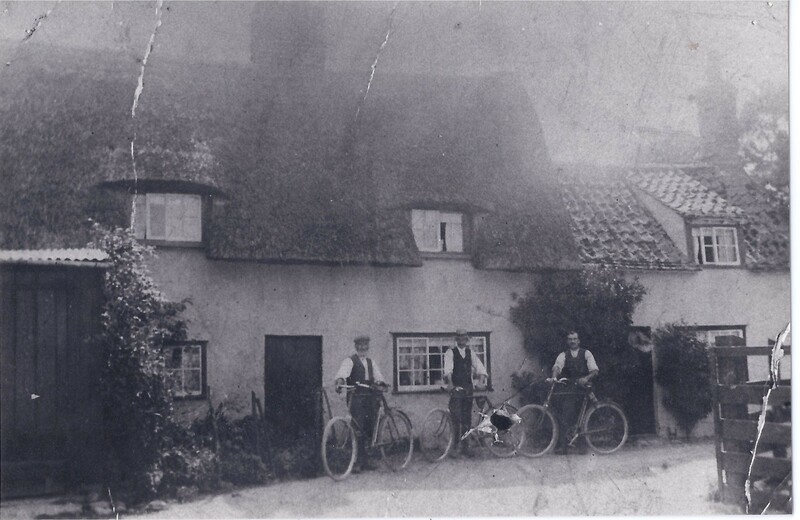 David also owned The Old Windmill on Newton Rd from 1895-99. His nephew Frederick Charles was a flour millers’ carter in 1901, living in Granary Cottages by 1915. After David died in 1900 his brother Jonathan (B:1854) moved to Fountain Farm – he had previously farmed 17 acres somewhere in Station Road. In 1911 three of David’s sons worked on Fountain farm with him. Jonathan died in 1934 but in 1937, Fountain Farm was still inhabited by a Wisbey. Harry Wisbey lived in Church Street in the 1950s and kept geese, according to Peter Wick who remembered him. Wisbeys were also involved in other trades. In 1937 Helene Greene wrote that the most important gravel digging along Button End belonged to Mr Wisby where he had installed a large gravel washing machine near his pit. This is now where the industrial estate is. James Wisbey (1807-1885) was a master carpenter and builder in the High St. In 1850, Allen Wisbey (1819-1890) was one of 4 shoemakers recorded living in Harston. Several sons were bootmakers working with him. In the London Gazette of Sep 8, 1882 Allen Wisbey was declared bankrupt so the business obviously failed, but his son Benjamin (1852-1919) was recorded as a bootmaker in the 1911 census in Harston. Helen Greene said in her book “Before 1924 there was a harness and shoemaker’s business owned by a man called Wisbey who lived at Camping Close and who had 4 apprentices working for him”. Jacob’s 5th child, 3rd son, also Jacob (1811-1869), is my great great grandfather. He became a well-known local preacher, setting up with others the Harston Baptist Church formally opened on 14 Sep 1858. I have extensively researched him (see Cambridgeshire Family History Society’s The Journal, vol 21, no 2, Apr 2015, pp3-5) and the WISBY/WISBEY family tree which has been shared with Hilary ROADLEY.